Friday giveaway, right on time. 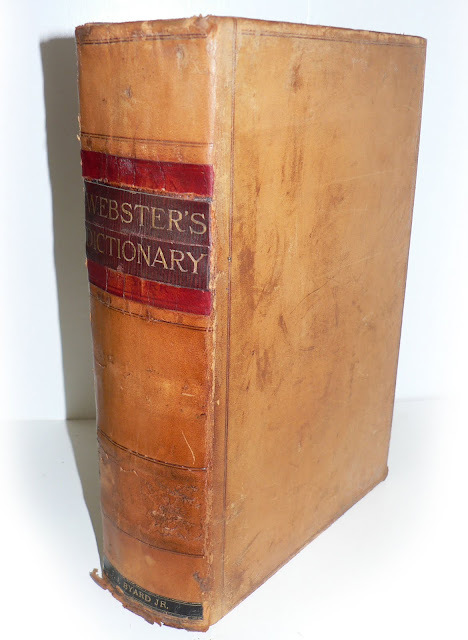 Today is a old Webster's "American Dictionary" published in 1843 by Harper & Brothers. Full leather binding, big thick book. Meaty. 8 inches by 10 inches with 1079 pages. Contest is closed, will be announcing a winner shortly. WOW that looks great! Count me in. ooh how fun! count me in, too! Oh man, I am so in. Oh, yes, please count this as an entry! I love meaty, in regards to book meat that is. Beautiful. My mom is the youngest of four sisters and as the youngest she graduated from college last. It had been a tradition for the four sisters to pass down their mother's dictionary from one to the other and eventually I ended up with it. Though my girlfriend doesn't really understand, that book with all it's coffee stains, ripped pages, scribbled notes and even a duct tape repair is one of my most prized possessions. awesome giveaway. I would look up the word "fanny." I imagine the example sentence looking something like this: "Goodness, Marcus, perchance your gaze has happened upon Gwendolyn's robust fanny?" This would make an awesome gift to my wife who is an English professor. Thanks for the opportunity. That is a truly momentous book! Wherever did you find it? OH MY GOD HOW do you offer these things for free? Fabulous! I would love to be it's new owner. Oh I would so love this as I collect them! Amazing this book is still around and looks in great shape! Thank you for another giveaway. This would be an awesome Christmas gift for my sister in law (who works for a newspaper) if I don't keep it for myself. Count me in, please! I have book envy! I'd love to enter. I have been following your blog for a while now, love it! Oh this looks nice. Thanks for the opportunity to win it. I just found this blog, and I must say I want your job. And that book. I want that book. Oh yeah, feel some paper between your fingers while you look up words. so much more satisfying than listening to the plastic clicking of the keyboard. I'm in. Wow, this is an amazing book! Ok, that is so cool. Count me in! Thanks! I use Webster's 1828 online all the time (except that no website gives everything that's on the pages of the actual dictionary). I love leather... count me in on this one. Would love to get this one...put my name in the hat, please. Oooh, this one looks interesting. I literally squealed when I saw this - does that make me a pathetic nerd? You can call me whatever you want if I win! I love dictionaries. This is an amazing piece! I too use the Webster's 1828 online. Not as good as a real book though. I'm too tactile a person. Most of my books, research and dictionary/thesaurus type are from C19 and I would love to add this. Imagine how many hands have paged through this over the years and what they were looking for. I'd love that. Gimme an entry! Goodness. That thing's absolutely gorgeous. Whoever does end up with the beauty is definitely very lucky. This is gorgeous! Please count me in! OOOOO! A dictionary! I love words! Ohhh this is a piece of art...I really need to smell the pages and feel the binding. My fingers are tingling! This is absolutely beautiful. Count me in! Wonderful book! I'd be privileged to keep it in my care. Thanks for the give-away! Please select me at random! I'm a dictionary nut. Maybe it's something having to do with the way they smell. beautiful! reference books are my favorite! 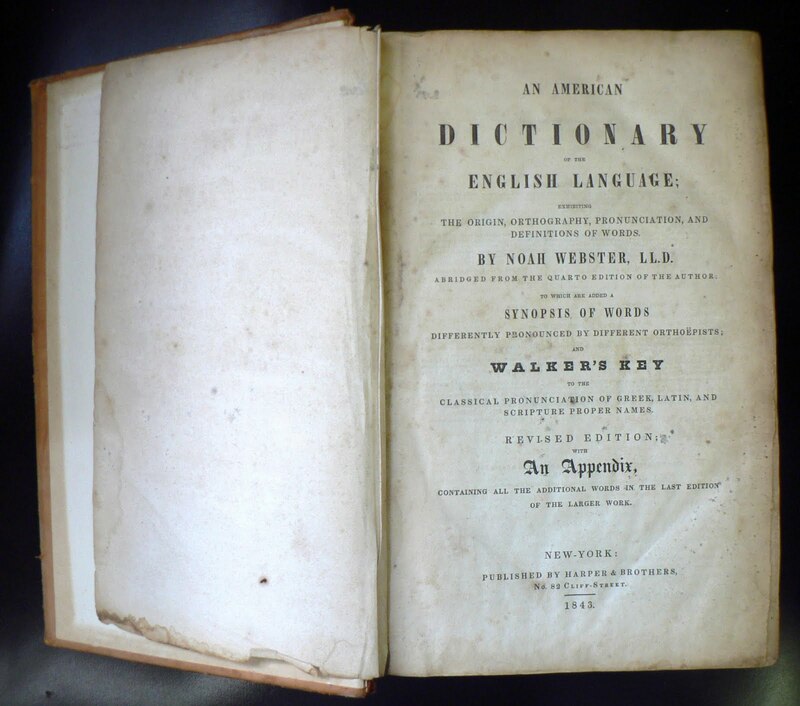 I am positively lusting for this dictionary! This would make an excellent gift for my parents :) Thank you for the chance!